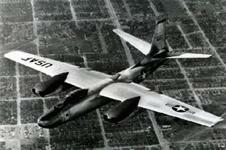 At the end of 1944, the U. S. Army issued a design competition for a jet-powered bomber. This urgent requirement given to aircraft manufacturers was precipitated by the discovery of secret documents and actual German jet aircraft captured during World War II. The first two American jet bombers produced were the North American B-45 Tornado and the Convair XB-46. 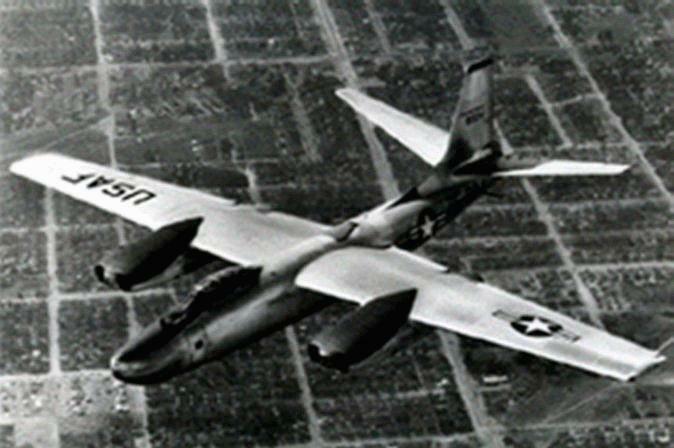 The B-45 filled a critical gap in the U. S. defense posture. The Air Force took initial delivery of the B-45C in May 1949. While a few of the aircraft were deployed overseas in late 1950, B-45 units reached initial operational capability (IOC) in 1951. As an Air Force bomber, it saw limited service with the Tactical Air Command during the 1950s. The Air Force accepted a total of 142 B-45s in various configurations, 51 aircraft fewer than originally ordered. The B-45 program included 3 experimental XB-45s aircraft (one of which was completed as a preproduction example), 96 production B-45As (some of which were designated as B-45A-5s reflecting in-production improvements), 10 B-45Cs , and 33 RB-45Cs. The aircraft were produced by North American Aviation, Incorporated, of Inglewood, California, with most of the aircraft being built in a former Douglas facility at Long Beach, California. The B-45 served well as a reconnaissance aircraft during the Korean war. The reconnaissance models were designated RB-45Cs and assigned to the Strategic Air Command. The Tornado performed classified, deep penetration photographic intelligence missions over many cold war communist countries. The reconnaissance version of the B-45 became the forerunner of the U-2 and SR-71 surveillance aircraft. Length 75 ft. 4 in. Height 25 ft. 2 in. Engines Four General Electric J47s of 6,000 lbs. thrust ea.